The north-eastern end of Exhibition Street seems an unlikely home for a world champion barista. But even though it’s away from the main CBD shopping strips, this small cafe is a hit with those in the know. 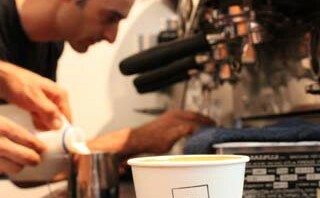 Simply follow the smell of roasted beans to find some of the best coffee in Melbourne. The narrow but light-filled interior offers a few tables, where a decent breakfast and lunch menu is chalked on a blackboard. Decent, yes, but it’s always going to play second fiddle to the coffee -and Con Haralambopoulos’s skills. One of three brothers behind the cafe, Con has won world espresso and latte art champion titles. And it shows. Warm cocoa notes dominate in a smooth and silky short black.The latte is simply stunning: there’s a hint of roasted almonds but no flavour predominates in the smooth,balanced brew that slips down without effort. This is a must-visit destination. This entry was posted in testcat and tagged 5 bean, gridlock. Bookmark the permalink.